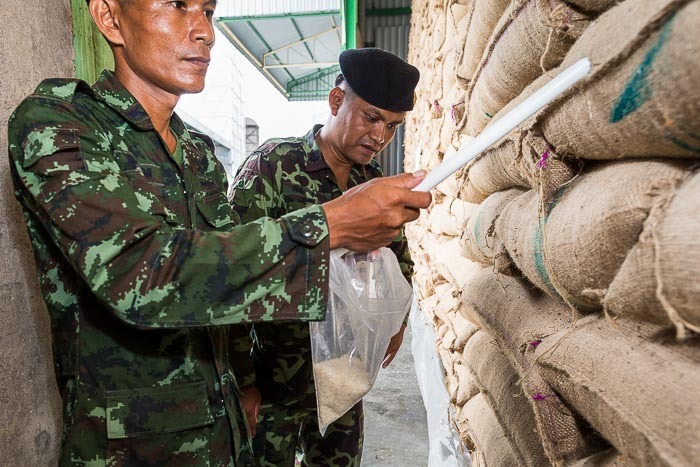 Thai soldiers take samples of rice from a warehouse in Wang Nam Sap, Suphan Buri, Thailand. Rice is more than just a grain in Thailand. It's a way of life, a driver of the economy and one of the most contentious political issues in the country. For decades Thailand was the world's leading rice exporter, wholesalers and industry titans got rich when Thai rice fed the world. But at the same time, Thai rice farmers did not reap the rewards of the seeds they were sowing. The governments supported by Thaksin Shinawatra enacted populist policies that guaranteed a minimum price paid to rice farmers. Basically, the government bought rice at well above market prices and warehoused it, keeping it off the market and hoping the artificially created rice shortage would drive up the price. Things didn't work out according to plan. Farmers weren't paid on time for their rice, forcing some to insolvency and driving others to suicide. Just as the Thai government was holding rice off the market, India and Vietnam brought new rice to market and prices actually went down. Other farmers, especially rubber farmers who didn't support the Shinawatra clan, clamored for equal treatment, closing roads and paralyzing parts of southern Thailand. Ultimately, the rice crisis and alleged mismanagement of the rice pledging scheme (the government called the plan a "scheme," use of that word doesn't have the same negative connotation in Thailand that it does in the US) was one of the leading causes of the political paralysis that gripped Thailand in the last year and led to the coup that unseated the Pheu Thai government. 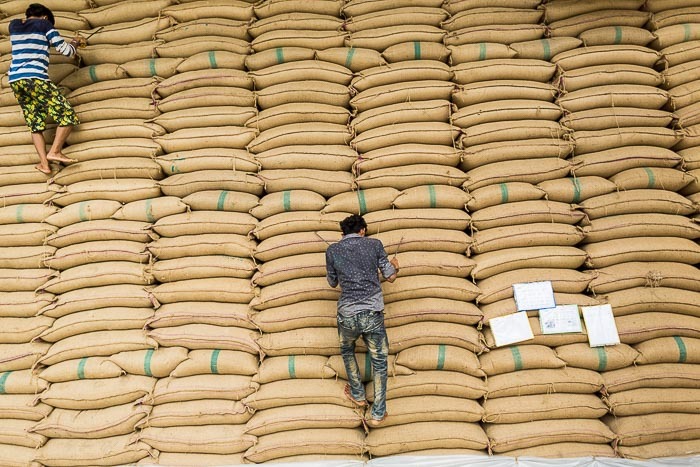 Workers climb down a bag of rice sacks in a warehouse of government owned rice in Suphan Buri. After the coup the military started inspecting rice stocks, looking for evidence of corruption and determining the saleability of Thai rice. I went out to Suphan Buri Tuesday to photograph soldiers drawing rice samples and agricultural inspectors testing the rice.